Have you ever had fabric so pretty that you couldn't cut into it? And then it sat on your shelf for years until you found the perfect quilt for it? The pattern is Vintage, one of my Cutie Patterns. (My winter photography has improved, but is still not great). I just need to make some pillowcases and then this pretty quilt will spend a month or so on my bed! I have at least 16 fat eighths left over in this fabric line. Which Cutie Quilt should I make from the oh-so-pretty leftovers? I am traveling home from Quilt Con in Savannah, GA today and wondered what I could post about improving my sewing room when I'm not even there. For the first time in forever (sing along if you must), I cleaned my sewing room and cleared all surfaces before I left. It is ready and waiting for me to dive into whatever caught my attention at the show this weekend. My sewing machines and longarms are empty and clean and awaiting their next projects. Even though my sewing room isn't magazine-photoshoot-ready, it is cleaner and tidier than it has been in years and I can't wait to get back in there and create something happy! I've never considered my decorating style to be overly "quilty," but as I look for quilts in my home to post every Sunday I realize just how many quilts grace my home. I have a space in my living room that hosts a rotating group of quilts -- Thimbleberries Club quilts from 2003 (I had to look that up). My challenge is remembering to change this quilt before the middle of summer! I'm making progress on my local quilt shop's batik BOM from 2013 or so. Apparently my quilt shop offered this same BOM quilt in two colorways this year and I signed up for both. I'm still at Quilt Con in Savannah and hope to make more progress on these BOM quilts when I get home. If you want to learn to free-hand quilt this swirl pattern, here's a 50% off link to my Craftsy class that teaches this pattern. I'm trying to be good, really I am. I'm trying to finish the projects clogging up my sewing room instead of starting New! Pretty! projects that are just begging me to adopt them. While trying to be good, I was stumbled upon This Pattern and I need to make it. I really, really need to make it. Would it be less like cheating if I made it from scrap fabric? I was thinking patriotic fabrics as a Quilt of Valor. Or maybe this happy-scrappy collection? What fabrics will you use for your Smile at the Rain? Pat Sloan releases her 182 Day Solstice Challenge free quilt block today and every Wednesday until the summer solstice. This is the first Wednesday I won't be home to stitch up the block and stay current. I'm a little stressed about that. Today I am on my way to Quilt Con, the Modern Quilt Convention, in Savannah. Being there will make me forget all about my stress! I promise to catch up as soon as I get home next week. Are you quilting along with this challenge? I am tickled to announce a new Cutie Pattern -- Irresistible! It is a simple four-patch quilt that can be made with a Cutie Pack (16 fat 1/8th cuts of fabric). The pattern includes four sizes and I made the queen sized one. 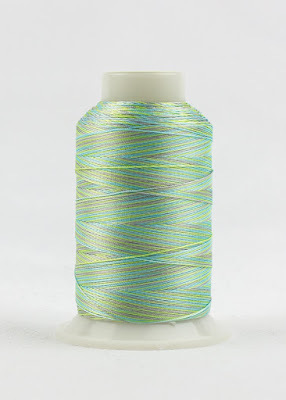 I used about 1 2/3 spools (700m) of FabuLux and 7 DecoBob bobbins. So now we know! So many people chimed in with a "This quilt is MINE!" when I was making the sample. My daughter saw this quilt on my binding chair while she was cat-sitting during my Harry Potter trip. She sent me a trip that said "For future reference, this quilt is mine." I had to send her a "Too late!" answer because the quilt already has an owner waiting for it when it finishes its time traveling as a sample. I will make my daughter a copy of this quilt and she'll get it even sooner! I can't wait to make this quilt in other fabrics and sizes. 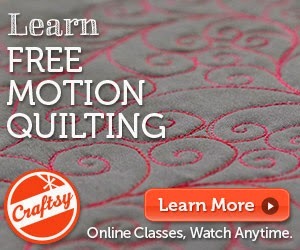 It is so fun to machine quilt and watch the quilt transform from "meh" to "WOW!" before my eyes! Last week I wrote about how I've been cleaning out my sewing room and donating unneeded craft supplies. As I'm digging through, I'm finding scores of projects in various stages of incompleteness. I can't work on 100 projects at a time (trust me: I've tried it), so what do I do with all of these found projects while they patiently wait their turn? Isn't that just a delightful mess? I really wish I could say that I only had one of these overflowing bins in my sewing room. I have never finished counting the number of in-process projects I have; I usually give up hope as I approach 200. In a perfect world. all of these bins would be empty and I would only have a few projects in process at any time. This sewing room isn't in that perfect world, so the projects just sit and wait for now. The fabulous Joanna Figueroa designed the mini quilt and I turned it into a pillow. Read about that journey HERE. This was my last week at home before my quilt travel season starts and boy was it a full week! If you don't know how to invisibly seam a backing, I wrote a quick tutorial HERE. This was the final week for the free Splendid Sampler blocks. The book will be available in April. I'll pick up the Splendid sampler again once the book is released. I pulled out another old block of the month quilt. This one is an original design from my local quilt shop from 2013 or so. I'm not a huge batik lover, but I want to finish this one up and send it along to its forever home. I had a full last week at home. Next week, my adventures begin with Quilt Con. I hope to be able to keep up with my "block a day" habit while I'm on the road. Stay tuned. Hurray! I finished another old quilting project. This isn't my oldest UFO, but it is far past the "decade" mark. And this is when my projects typically come to screeching halt because... Binding. I am practicing machine binding using Pat Sloan's method. I used the same threads for the binding that I did for the quilting. I like how the Midas Touch looked on the black binding! How did quilters ever live without these binding clips? The back of the quilt shows the blanket stitch and I still prefer the look of hand binding, but I will keep working on my machine bindings to get these UFOs finished and to their forever homes! I need to make This Quilt. Need. This Quilt. Now. It is for sale until February 18, so I'm going to buy the pattern now and make it later. Maybe I'll use these fabrics? Why I hate binding: Reason #4971. A year ago today Pat Sloan and Jane Davidson launched The Splendid Sampler, a year-long quilt along with 100 blocks from 80+ designers. Have you been quilting along? The Splendid Sampler designers are celebrating this anniversary with some fun giveaways. Go HERE to enter to win some fun prizes. I've pre-ordered the book and can't wait for my copy to arrive. My quilt won't remain a UFO forever! Follow me on Instagram @debbybrownquilts to see my daily progress on my backlog of Block of the Month quilts! I think it will be easier to clean and organize my sewing room if I have less stuff in here. I have been hard at work for the last six weeks finishing quilts to move them out of my sewing room. I've also moved other things out of my sewing room to make room for the all of the Happy that I want to live in there. I realized that I am a quilter, so I got rid of everything that isn't related to quilting. All of the supplies that support these hobbies have been given to charity groups or individual crafters, or have been recycled. Have you re-evaluated any hobbies and decided they were no longer for you? Did you regret it or did it make you feel a little less burdened? Even though I give away most of my quilts, many still grace my home. This quilt tells the story of a very difficult time in my life and quilting my story helped me through it. I tell the story of the creation of this quilt HERE. Have you every quilted a deeply personal quilt? Do you treasure the result, or did you need to make the quilt and leave it behind (I can see both sides of that one)? I have over 20 block of the month quilts in process. That is overwhelming, to say the least. It is my goal to finish one block a day. It's a big goal (BIG!) and I don't know that I'll succeed, but drastic times call for drastic measures. I have finished all of the blocks for one BOM so far this year, but haven't yet finished that quilt. I'm working on my Splendid Sampler blocks. I also worked on my 182 Day Solstice Challenge. Oh how I love this block! I've never done much machine applique, and now I wonder why! I wonder which BOMs I'll work on next week?